Everyone remember that tame, sane film of Terry Gilliam’s? Neither do I. Gilliam seems to be a visionary man of sorts, though precisely what visions those are we may never want to know beyond the scope of his consistently strange and controversial films. 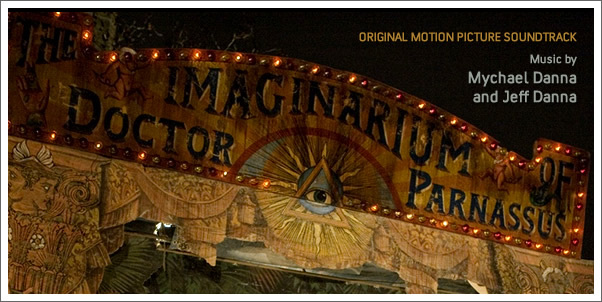 THE IMAGINARIUM OF DOCTOR PARNASSUS, of course, also stands as a parting gesture from the late Heath Ledger, who passed away while the film was still in production in 2008. Critics have been ambivalent about how the major revisions to the script and cast that followed have affected the final product. What remains for certain is that the stellar cast has provided truly heartfelt performances in memory of their friend, and the film is just as lush and dark as the best of Gilliam’s oeuvre. There’s almost always a touch of magic in his work, and in this 2009 offering, THE IMAGINARIUM OF DOCTOR PARNASSUS, we find a culmination of many familiar thematic ideas. So too with the score, courtesy of the Canadian film scoring brothers, MYCHAEL and JEFF DANNA.